Starting on a positive note, Juliet Moreau is a YA heroine that I can definitely respect. After being "orphaned" previous to the events in The Madman's Daughter, she found a job to keep her off the streets and out of brothels. Any lady who can make it (even barely) on their own in 19-20th(ish) century London is impressive in my book. I loved how she would not take no for an answer when she set her mind to something, even though most of it was folly. Juliet did get annoying when the love triangle surfaced (yes, there is one of those), but I'll make allowances for her because women tended to be a little silly when it came to love in her time period. I love old school sci-fi and horror, and I enjoyed the very dark novel that The Madman's Daughter is based on, The Island of Doctor Moreau. 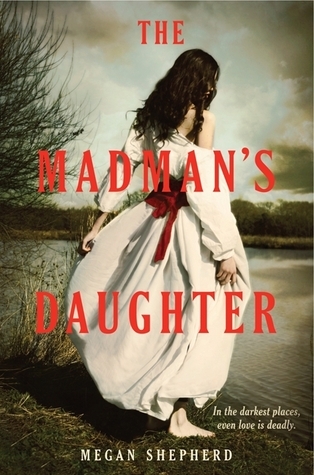 There are parallels between the two novels, but The Madman's Daughter is its own book. The Island of Doctor Moreau focuses more on the horrors that the narrator, Prendick, faces on the island. The Madman's Daughter has some of that horror, but is more of a love triangle needing to be sorted against a dark backdrop, making it more appealing and accessible to young readers than its predecessor. The problem that I had with The Madman's Daughter is what I said before - the romance. It takes away from the tension that is created by the horrors of the island and what Juliet's father has been doing. I found it hard to care whether or not Juliet, Montgomery or Edward survives the island when their focus is more on each other. By the time the plot thickened and there were twists to the triangle, I really didn't care what they did. Though The Madman's Daughter wasn't my favorite, it's still a book with merit that I know a lot of readers will enjoy. I may not finish this series of Shepherd's, but I will be following her future work with interest. I'm always a bit nervous reading reviews for books I really loved since you never know if others will as well. I understand your issues though. I think if I wasn't so enraptured by the rest I easily could've been as well. If you do decide to read the next book the romance aspect isn't as prevalent but it does still have some. Great review though. It's hard for me when I love the originals so much, and since romance wasn't something in the original, it kind of made me side-eye this one. I mean, the writing was good, and I never wanted to DNF, but it was really hard for me to decide if I liked it or not in the end. You'll want to skip book two, because apparently the romance takes over EVEN MORE and gets worse. So yeah. I thought Madman's was fairly good, though. If only it were a standalone. I tried to start book two, but I got really bored. But then again, I've been so snobby about everything that it's a wonder that I'm still reading. I have to say I barely even noticed the romance in it because I was so intrigued by the mystery of it all. But, to be fair, I've never read The Island of Dr. Moreau so I was experiencing that part of the story for the first time! You are making me want to go back and read the original. I might like it even better!